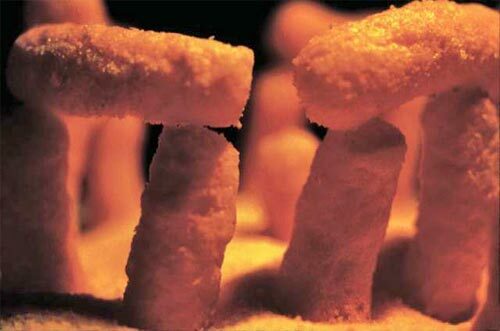 This is the picture that sparked the creation of Clonehenge, the cheese puff trilithons of California. According to the Los Angeles Times, this Stonehenge replica “constructed from cheese puffs was part of a 2003 art exhibit courtesy of the Joslyn Fine Arts Gallery on display at a shopping mall in Torrance, California.” Photo taken by John Ahr. This article in the L. A. Times includes some great links, including one to this excellent article at Roadside America.com. The first three paragraphs express our thoughts on the subject pretty well. For example, “We figure that the ancient megaliths must emit an invisible energy field powerful enough to enslave sculptors, builders, and the odd guy with too much time on his hands.” Exactly. Is it related to the crop circle phenomenon or to the approach of 2012? Who knows, but ya gotta love it! We hope to cover all of the henges mentioned in the above articles as this blog continues. Points for using what would appear to be an impossible and completely inappropriate material. Score: 7 druids!